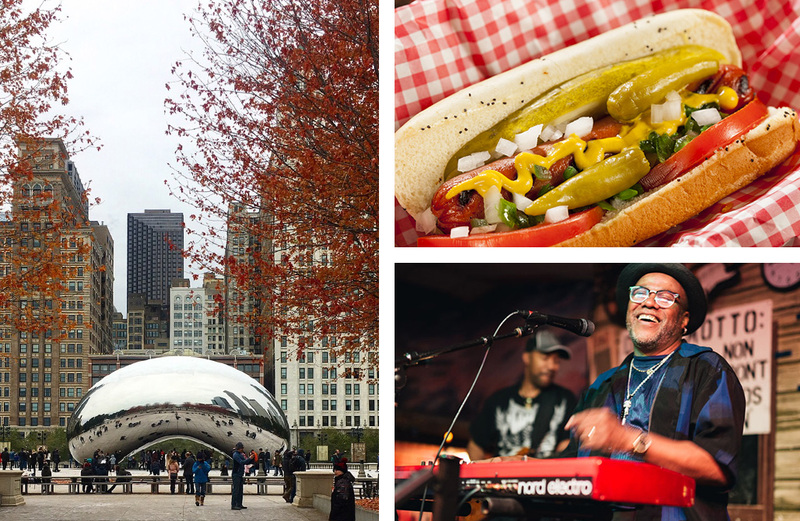 Home to deep dish pizzas, hot dogs and that weird bean, it’s not all that surprising we’re kinda obsessed with Chicago—if it’s good enough for Oprah, it’s good enough for us! While you could easily spend a week exploring Chicago, we know your time (and your annual leave) is precious, so if you’ve only got a couple of days to see it, here are all best of the best things to do in Chicago. Make your life super easy and book as much as you can before you go. We used Expedia to book our flights, hotels and a couple of the amazing tours we did (including the Bikes, Bites & Brews tour which you really cannot miss). If there’s one thing you take away from this guide, it should be that you want to stay on Magnificent Mile! We stayed at Omni which was walking distance from so many shops, restaurants, art galleries and sites. Basically, it’s the PLACE to be when visiting Chicago. Start your day right with some breakfast and a coffee from Goddess and the Baker just next to Millennium Park. You should also get a little something sweet to take with you because it’s all just so dang delicious. Did we mention your time in Chicago is not going to be kind on the waistline? You should probably deal with that fact now. Millennium Park is home to some world class architecture, a whole lot of greenery (or snow, depending on the time of year) and some pretty impressive art, so you’ll want to get acquainted with the area quick smart, so go for a stroll and appreciate the beauty. If you’re lucky enough to be there in summer, they run free concerts and outdoor movies, while in winter it’s home to an ice skating rink. Any other time of year it is just damn beautiful. Don't miss the famous bean, if you don't get a selfie in front of it, did you even go to Chicago? If you want to take your walk nek level and learn a bit about the city, book yourself a Chicago Greeter in advance. Chicago Greeter is an epic service that gives you access to FREE tour guides all over the city. You just book a couple of weeks in advance and you’ll get a fully customised 2-4 hour tour from a local volunteer—we did for this Millenium Park and would 100% recommend it as they’ll give you plenty of hot tips for what to do on the rest of your stay. Get your quads and your taste buds warmed up before you head to Bobby’s Bike Hire for the Bikes, Bites & Brews tour. This tour is fast paced and oh so much fun, plus you get alllll of the food, no sample sizes here! You’ll start by cycling your little heart out to the first stop—Giordano’s deep dish pizza. (Yassss!) This is honestly some of the best deep dish pizza in the city, and you’ll get one MASSIVE slice to enjoy before peddling on over to taste a beer or two, followed by cupcakes, then hot dogs (you haven’t had a hot dog until you’ve had a Chicago hot dog) then more beer. After cycling through some of Chicago’s most stunning neighbourhoods, you'll end with a cycle along Lake Michigan, plus it’s pretty much the best way to get your bearings while inhaling some of Chicago’s best noms. If you’re an architecture fan, you’ll want to get yourself straight on board Chicago’s First Lady Cruise. They’ve partnered with the Chicago Architecture Foundation so that you can sit back and relax with a drink in hand as the guide talks you through all of Chicago’s most impressive architecture (there’s A LOT!). Even if you’re not a mad architecture fan, being on a boat is always fun and it’s a fab way to see some more of this beautiful city. A couple of hours have passed since your last hot dog, so it’s time to eat again, huzzuh. Spiaggia is just around the corner and if you want to go all out fancy pants, this is the place to do it. If you’re feeling a little more low key but still want delicious food, Cafe Spiaggia is where it’s at. The drinks list at Cafe Spiaggia is loaded with perfectly mixed cocktails and all the Italian wine, while the dinner menu basically reads epic Italian noms. Start with some charcuterie, burrata, meatballs and whatever else tickles your fancy before moving on to the homemade pastas. The gnocchi, the carbonara (which is not your average carbonara!) and the farfalle with mushroom conserva, arugula, leek cream are winning dishes, but you can’t go too wrong with anything. Finish the night with some tiramisu and/or an espresso martini and you’ll be a happy traveller. Hopefully you had enough espresso martinis at dinner to keep you going (if not, you’d better order one or two quick smart!) because it’s going to be a late night. You’re off to one of Chicago’s most famous blues clubs, Kingston Mines and it’s probably going to be the best night of your holiday. The place is always packed (and the lines get long, so don’t go too late) and pumping, so try and find somewhere to perch, order a drink and soak up all of the good vibes. 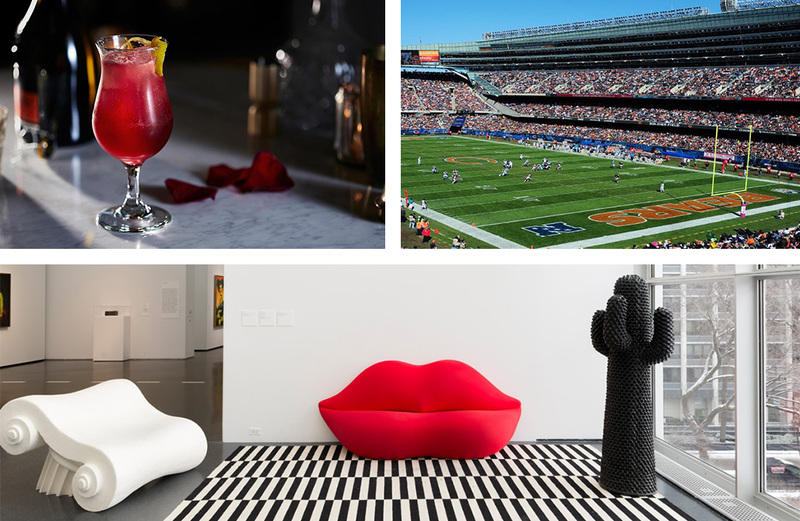 You’ll want to sleep in after last night, and luckily the Museum of Contemporary Art Chicago doesn’t open until 10am so you’ve got until then. Stop in at the cafe downstairs for a surprisingly good coffee and something to fill your belly before spending an hour or so wandering through the museum. It’s not huge but you’ll find all sorts of art that will make you stop and think a little. Go and watch a Bears game! If you’re lucky enough to be in Chicago while the NFL is on then you absolutely have to catch a game. You’ll likely have zero idea what’s going on, but grab a giant beer and a hot dog and just scream when the people next to you do. A quick tip from us to you: make the most of US Sports Tickets and lock your tickets in before you leave Australia! If you’re really not into sport, you can stay in art mode and head straight to the Art Institute of Chicago. It’s one of the biggest and most impressive art museums in the US and you could quite easily spend a whole day here. Grab a map and a program of the current exhibitions and start wandering. Head back to the hotel, take a nap if you’ve got time and then get yourself ready for tonight’s antics! You’ll have to get your detective on to find this place, but it’s totally worth it. The Violet Hour is one of Chicago’s best cocktail bars and they whip up some seriously tasty drinks. If you’re a real cocktail connoisseur, book yourself in for a private class and learn from some of the best. If you’d prefer someone else make your drinks for you, take a seat on one of the plush armchairs, order a drink and enjoy the dimly lit, curtain draped salon. Once you’re sufficiently cocktailed up, wander around the corner to Publican Anker for a seriously amazing meal. Start by sharing the pickles, frites and the pork rinds with your mates, then get a burger all for yourself—they’re drool-worthy! If you’re really hungry, share some chicken wings too. YUM! 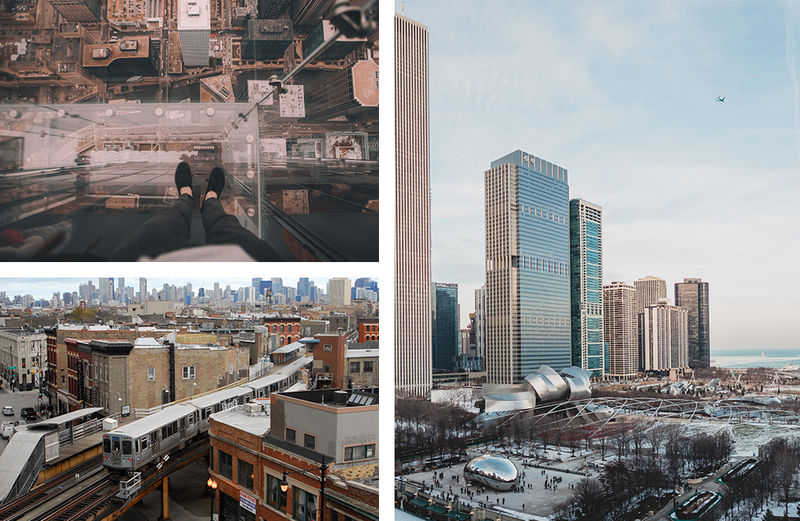 Hopefully you’ve got a little bit of time up your sleeve before you have to jet off to your next destination, because Chicago’s Skydeck is absolutely not to be missed. Take the elevator up to the 103rd floor and then close your eyes and step out into one of the glass boxes before opening those eyes back up and looking down (and then freaking the eff out). It’s mind-blowingly scary and it will probably take you a few attempts, but it’s pretty incredible. If you’re brave enough to go up that high but not brave enough for the glass boxes, fret not, you can stay on solid (non-transparent) ground while you’re up there. If you have any more time, go back to Wicker Park (the cute 'burb which is home to The Violet Hour and Publican Anker) and take a stroll through the neighbourhood. It’s known for its artsy vibes and there are a tonne of cute boutiques. We love Gather Home & Lifestyle for gifts, Saint Alfred for the coolest kicks in town and Moon Voyage for maxing out your credit card (and the super cute jewellery). If you can fit one last meal in before you have to leave, get yourself back to Magnificent Mile for lunch at the Ralph Laurent restaurant. They do some seriously fancy grilled cheese and truffle fries that you just need to try before you leave Chicago! Need some help deciding where to go next? How about New York City? Editor’s Note: The author of this article was hosted by Brand USA and Expedia in Chicago, but as always, the opinions and recommendations are their own.